It’s a bit early for Halloween you might think. I know it is, I’m not trying to rush you through the first half term, when many of you will only have just started waving off your little darlings at the school gates. It’s never too early to think ahead though is it? It’s also helpful to have a few ideas up your sleeve. 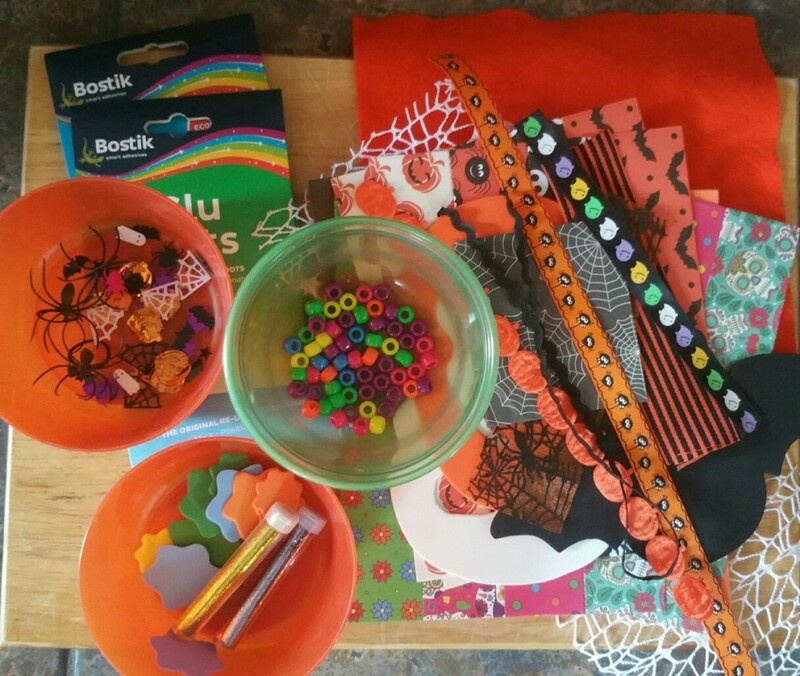 Having a theme with craft sessions can be a lovely way to inspire creativity and Halloween, you have to admit, is a great theme no matter if you are baking, making or dressing up. At the weekend our big girl was off having an amazing time at the Olympic pool in London, training hard and enjoying an Olympic experience, so I set to work with the three boys and some Halloween inspired craft. After looking though a range of bits and bobs from Bostik, the boys decided they wanted to make Halloween chains. After they’d spent twenty minutes scaring each other with the spiders that is! They spent ages looping and tying, practicing cutting, sticking and gluing things together to make ‘circles’. After they had practiced knotting fabrics and designing their own mixed material chains, we set to together to make some of the more delicate paper chains. 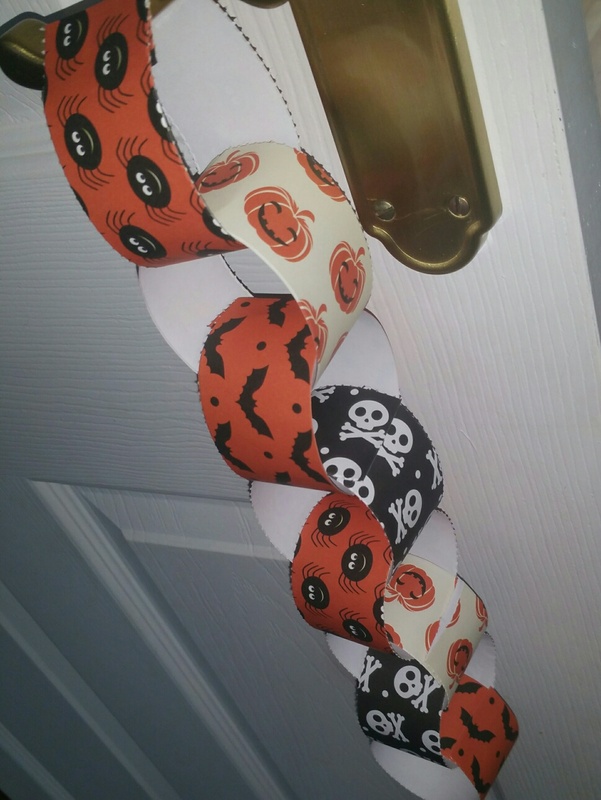 We make paper chains for all sorts of things – Easter, birthdays, Halloween and Christmas. They are great fun and we like to see how long we can make them. 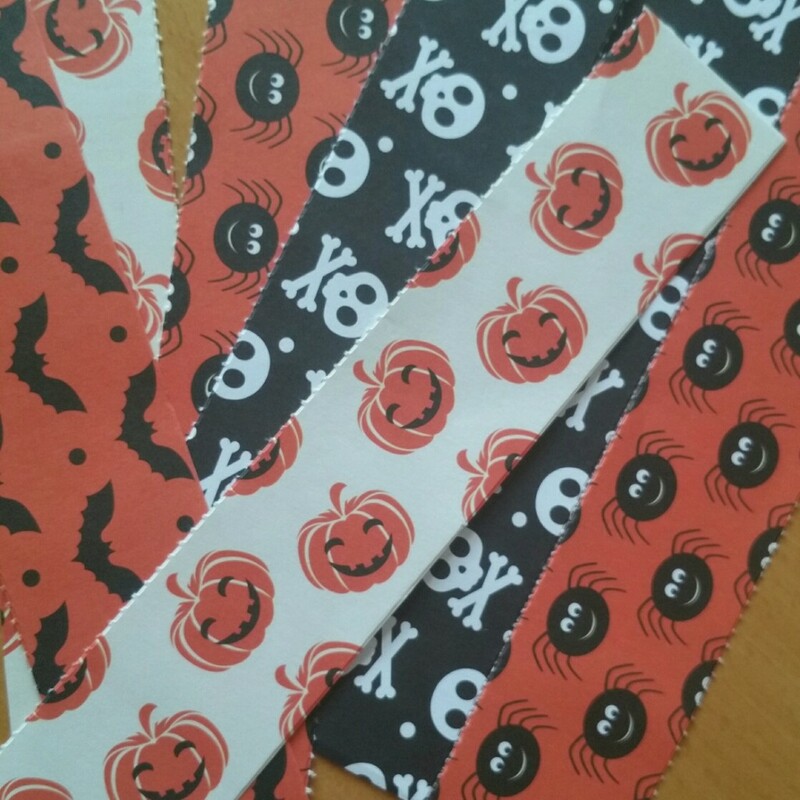 We used some funky Halloween perforated sheets to make these chains. The boys folded the sheets and I separated the paper for them as they struggled to tear them in the correct place. 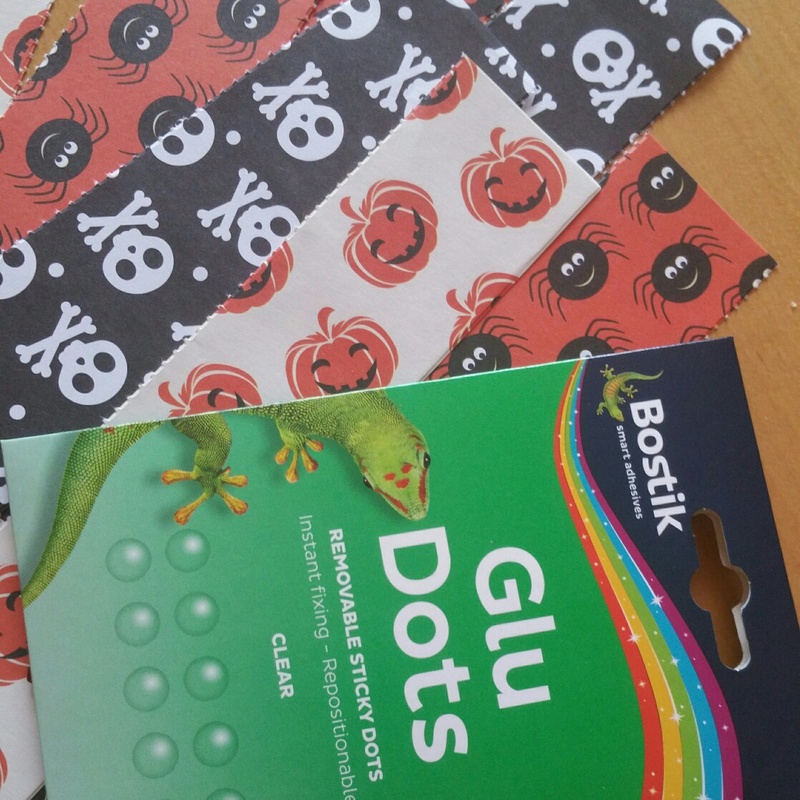 We used Bostik sticky dots to join them together and the boys loved peeling the dots off and attaching them. I was actually surprised how easy the little boys found this as I think they are quite fiddly. 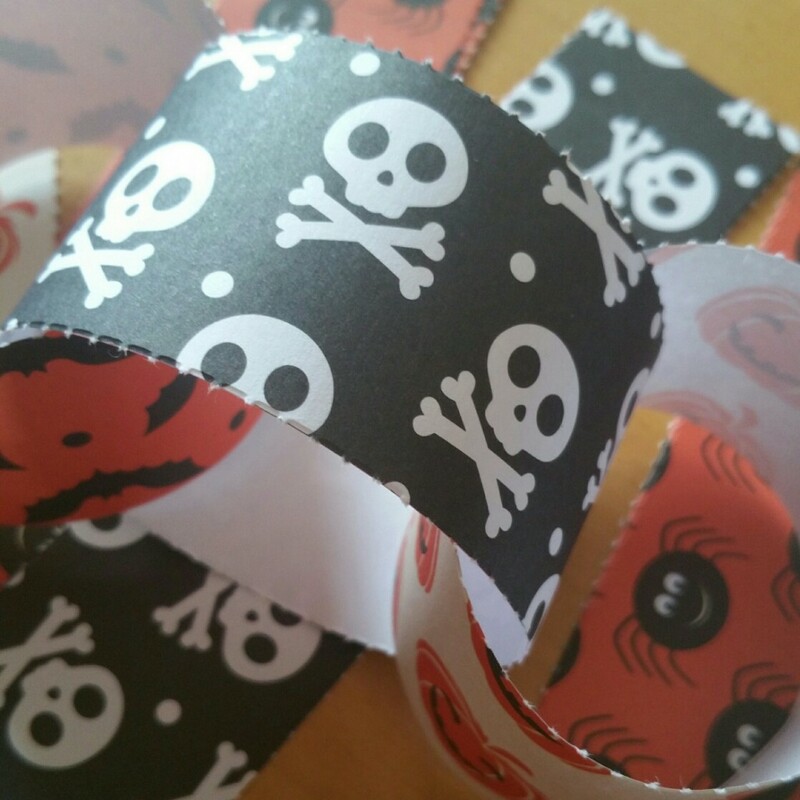 They loved the skull and cross bones print and the spiders the most, so there were the normal sibling disputes over who got to stick those ones together. Before long one had broken someone else’s ribbon chain, one had pulled apart another’s felt chain, and, as you parents will know that was that…and all before I’d photographed their gorgeous creations too! By sheer luck I think the fragile paper chains survived the dispute and here they are to show what a good little team the boys can be! I can’t wait until Halloween. I love making crafts with my children.